Dave Smith Tempest Drum Machine: 16 velocity sensitive pads, 6 analogue voices with 2 analogue oscillators and 2 digital oscillators each. Tempest is a collaboration between Smith and longtime friend and fellow instrument designer Roger Linn. Though they've consulted with each other on past projects, Dave Smith Tempest marks the first time a product will carry both the Dave Smith Instruments and Roger Linn Design logos, referring to Linn's legacy as inventor of the digital Drum Machine. 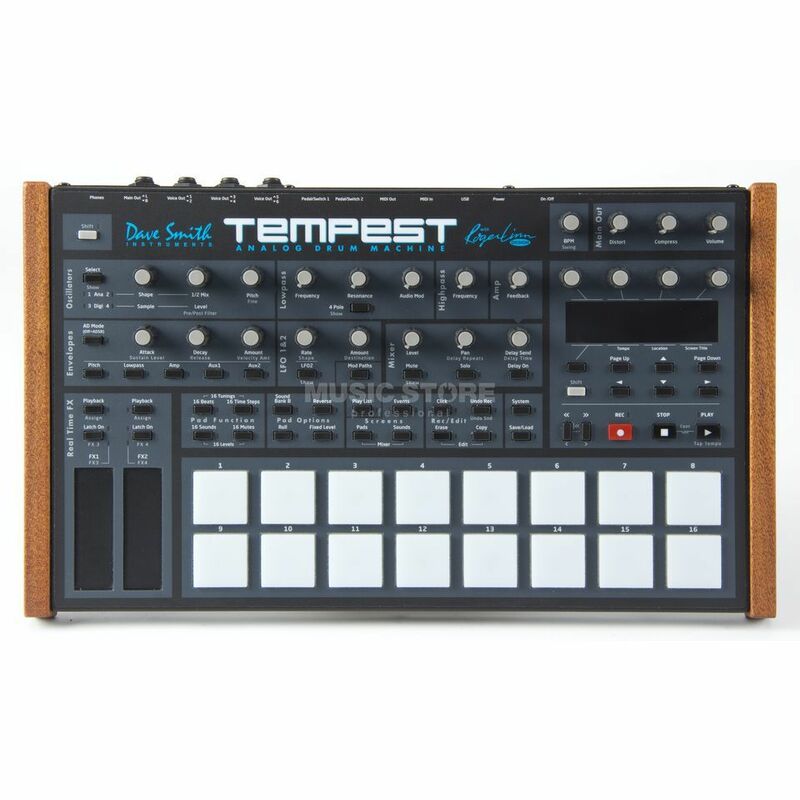 The DSI Tempest drum machine utilizes analog synthesis to generate the sounds. Tempest's 16 velocity- and pressure-sensitive pads are arranged in an 8 x 2 array to facilitate both real-time and step entry of beats. Two pressure- and position-sensitive Note FX slide controllers provide a unique new method of performance and control. Each of the 6 analog voices has 2 analog oscillators plus 2 digital oscillators (with a large bank of included samples), Dave's classic analog low-pass filter with audio-rate modulation, an additional high-pass filter, analog VCA with feedback, 5 envelopes, 2 LFOs, an extraordinary variety of analog modulation routings, and stunning sonic quality, warmth and punch. Although optimized for drum sounds, the DSI Tempest excels at tuned sounds as well, and even doubles as a 6-voice analog synth. In addition to the 6 direct voice outputs, there are stereo mix outputs and phones outputs, plus 2 inputs for foot switches or expression pedals, MIDI in/out and USB.